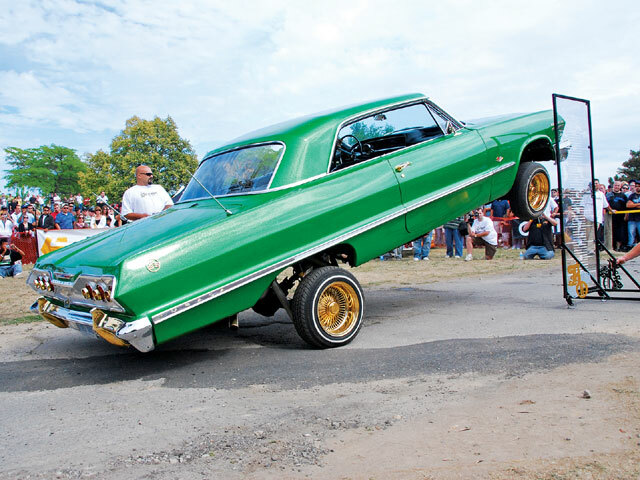 Although the lowrider culture is active from coast to coast and embraced by millions of enthusiasts around the world, there are still a few locations where the idea is still coming of age. 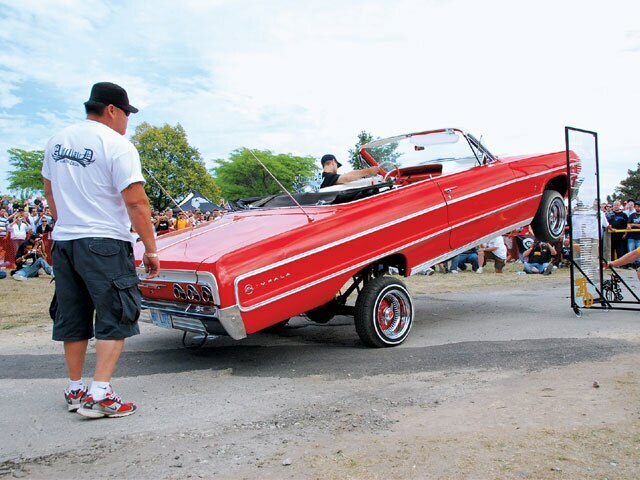 To see what the scene was like a few years back, spend a pleasant weekend in Canada, where you’ll find that the sport of lowriding isn’t quite as well known as it is in California, Texas or Florida, but the enthusiasm is genuinely high. One club in the area is dedicated to expanding the sport and increasing the area’s enthusiasm even more for our favorite rides. Joe Wing and the members of Rollerz Only Car Club have been spreading the word about the lowrider culture for almost a decade. Joe saw the need for a new approach to car shows, since few that he attended even had lowrider classes. Starting small, the club events expanded each year. In fact, the 2007 Scrape By The Lake Car Show attracted its largest audience yet, with truck and import drivers enjoying the friendly atmosphere as well. Planning for the show begins shortly after the previous year’s event ends, and the smooth-running shows have become a big event on the Canadian and Eastern United States auto show calendar. 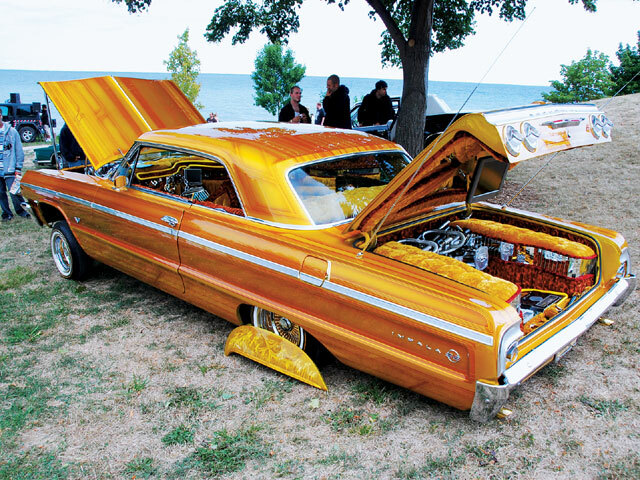 Held just a short cruise from the world’s most famous waterfall, Scrape By The Lake attracted more than 500 vehicles this past year and almost 5,000 spectators to admire the colorful collection of lowriders, trucks and imports in a beautiful scenic setting. Charles Daley Park in St. Catharines is on the shores of Lake Ontario, offering white sand beaches, shade trees, grassy display spaces, and food vendors, along with all of the legendary attractions of Niagara Falls after the show. The Rollerz Only crew, assisted by an army of friends and family, handled the parking and judging, accomplishing both with the easy familiarity that comes with experience. Once everyone was settled, the crowd wandered the rows of cool customs, greeting friends, grabbing one of Papa Shanowski’s famous sausages, and looking forward to the hydraulic competition. At 3 p.m., everyone gathered at the “Hop What You Brought” hydro pit, eager to watch the action and see who would take home a share of the $1,400 prize money. Single- and double-pump vehicles lined up and the crowd showed its appreciation for every contestant. While the numbers might not be high to an L.A. crowd, the enthusiasm of the fans was genuine. The Single-Pump Hop win went to Rollerz Only member Jeff Hagen and his green metalflake ’63 Chevy Impala SS, but not before Jeff took a little kidding from emcee Joe Wing who wondered if he would better his 6-inch score from last year. Jeff pumped the number up considerably, hitting 35 inches for the Single-Pump win and $200. Hai Tran captured the Double-Pump prize with his ’64 Impala convertible. From Affiliated C.C., Tran sent the Chevy to 36 inches, taking the category win plus pocketing $500. Luxury Open went to Wayne from Switches and Thangs. 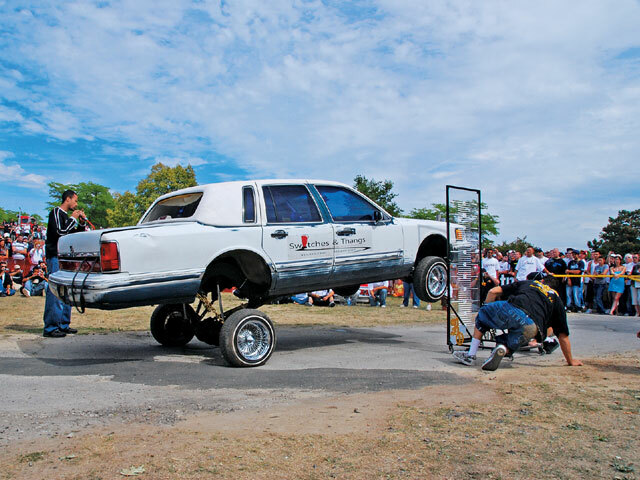 Wayne was last year’s winner and he repeated his performance again this year, sending the white Lincoln Town Car to 26 inches and collecting $200. The Truck Open category also saw a repeat winner with Mario and his primered Chevy Blazer. From Back Alley Cruisers, Mario launched the Blazer to 37 inches, high enough to take the $200 class prize. The real crowd pleaser of the event was Rob and the crew from Altered Altitude Customs. Their air-hopping Ford Ranger leaped more than 6 feet off the ground last year, and this year, switching from nitrogen to helium, they were able to significantly increase the pressure. The truck’s first hop was probably more than 8 feet off the ground and it continued to impress the crowd, bouncing and rolling at will. The roar from the spectators was one of genuine approval. With hardly a break in the action, the second-most-looked-forward-to competition began as the ladies lined up for the Miss Scrape By The Lake Bikini Contest. A dozen beautiful gals took the stage and when the votes were in, Anne Marie, Jen and Laura shared the $500 purse. The awards ceremony saw the elegant “Unpredictable ’64” Impala capturing the top prize. Originally built by Jose Monreal and now owned by Raffaele Grano, the ’64 is loaded with exquisite detail. The combination of a gold scalloped paint job, plush crimson and gold mirrored interior, and chrome setup and undercarriage made “Unpredictable” impossible to beat. The car captured Best Paint Car, Best Interior Car and the overall Best Lowrider of Show. Another 250 or so drivers headed home with trophies that will become permanent reminders of the good times at the Scrape By The Lake. For their always gracious Northern hospitality, we’d like to say a special thanks to the members of Rollerz Only, especially Joe and Debbie, Pete and Erin, Jeremy, Jeff, Glenn, “Dirty,” and the rest of the R.O. crew. We would like to especially applaud their untiring efforts in promoting the sport of lowriding north of the border! For more information on Canada’s Premier Lowrider Show in 2008, check out www.scrapebythelake.com. The crew from Altered Customs in Toronto blasted their helium-powered Ranger skyward. Alex Pavlov’s bright gold ’65 Impala rolls on 14s and drew a big response. 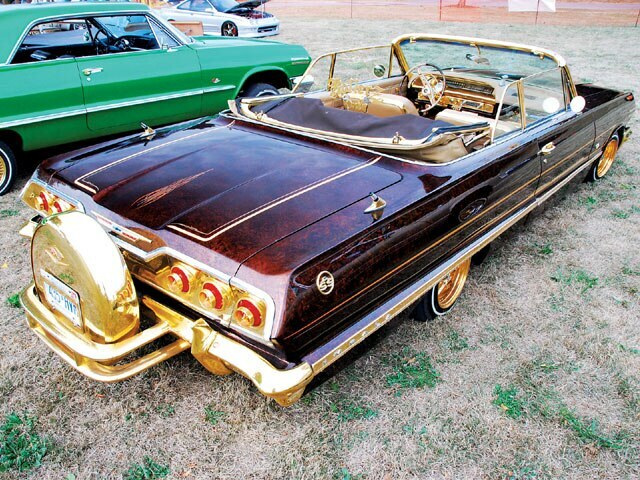 Glenn’s 24-karat gold Impala convertible wears a Continental kit. 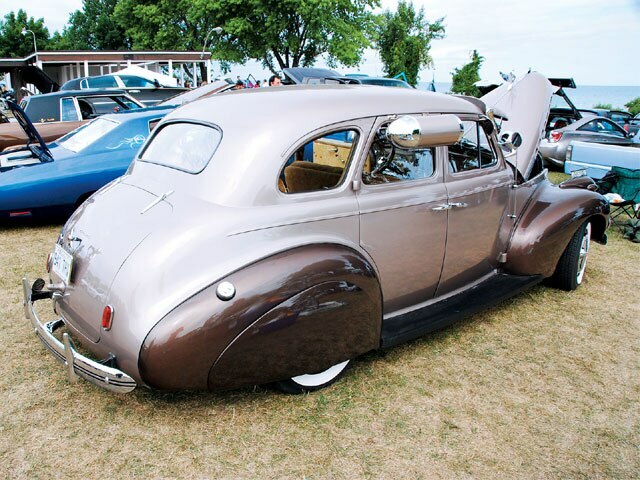 David Gravelle’s ’40 Chevy Master Deluxe scored nostalgia points. Dave’s stereo-equipped ’98 Cadillac attracted spectators to his booth. “Visual HP” is a beautiful ’63 Buick Riviera belonging to Shawn Torgerson. Lowriders lookin’ good with the blue Lake Ontario as a backdrop. The “Unpredictable ’64” owned by Raffaele Grano captured Best of Show honors. Wayne’s Town Car went to 26 inches. Double-Pump winner Hai Tran soared his Impala to 36 inches before three-wheelin’ out. 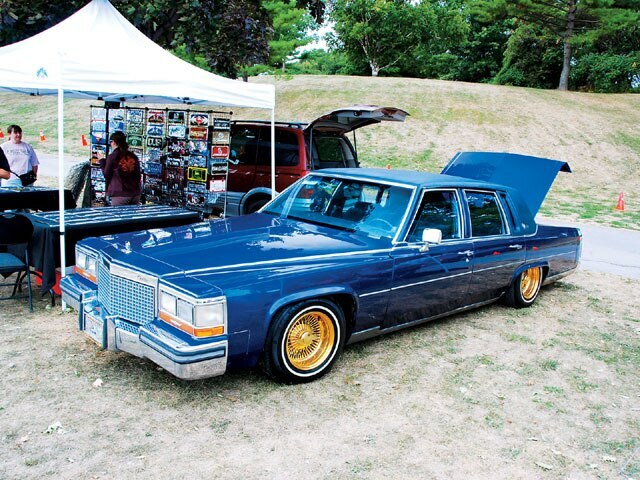 This Lincoln Town Car hit 20 inches. Jeff’s ’63 with Pete at the switches hit 35 inches.